Polythene bags supplied in a box with a dispenser type opening. A linear blend bag with a strength equivalent to a standard 200 gauge polythene bag. Suitable for food use. This is our most popular range of medium duty polythene bags. Ideal for a wide variety of uses. If you can't see the size you need, try looking further down the page at the paper/polythene wrapped bags, as there are some different sizes available in that range. Product description: Polythene bags supplied in a box with a dispenser type opening. A linear blend bag with a strength equivalent to a standard 200 gauge polythene bag. Description: "Picture of boxed linear blend polythene bags"
IF YOU CAN'T SEE THE SIZE YOU ARE LOOKING FOR IN THIS SECTION PLEASE LOOK FURTHER DOWN THE PAGE AT THE PAPER/POLYTHENE WRAPPED BAGS, AS THERE ARE SOME OTHER SIZES AVAILABLE IN THAT RANGE. Polythene bags supplied in a box with a dispenser type opening. A linear blend bag with a strength equivalent to a standard 250 gauge polythene bag. Suitable for food use. This is our most popular range of medium duty polythene bags. Ideal for a wide variety of uses. If you can't see the size you need, try looking further down the page at the paper/polythene wrapped bags, as there are some different sizes available in that range. Product description: Polythene bags supplied in a box with a dispenser type opening. A linear blend bag with a strength equivalent to a standard 250 gauge polythene bag. Clear Medium Duty Polythene Bags 200 Gauge (50 micron). Suitable for food use. Ideal for a wide variety of uses. Supplied in paper or polythene outers to make them easy to get at. 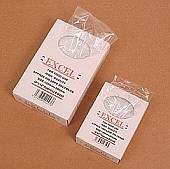 We also supply many of these sizes in dispenser boxes if you would prefer that option.The boxed bags can be found elsewhere on this page They can either be sealed with a bag neck sealer, from our range of tape dispensers (which can be found in the Retail Packaging section of the menu above), or with a heat sealing machine. Clear Medium Duty Polythene Bags in a polythene or paper outer. 250 Gauge (62½ micron). Suitable for food use. Ideal for a wide variety of uses. Supplied in paper or polythene outers to make them easy to get at. They can either be sealed with a bag neck sealer, from our range of tape dispensers (which can be found in the Retail Packaging section of the menu above), or with a heat sealing machine. Product description: Clear Medium Duty Polythene Bags 250 Gauge (62½ micron). Suitable for food use. This is our most popular range of clear 62½mu medium duty polythene bags. Ideal for a wide variety of uses. 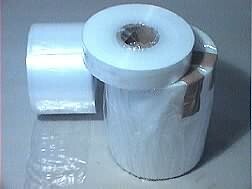 Description: "Photo of a plain clear polythene bag"
Clear Medium Duty Food Safe Polythene Bags 250 Gauge (62½ micron). Ideal for a wide variety of uses where a slightly stronger medium strength bag is needed.